20,000 watt, 225 volt bulb for the Arri T24 Fresnel. 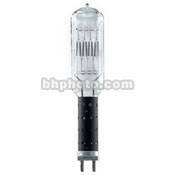 Lamp - 20,000 watts/225 volts - for T24 Fresnel is rated 5.0 out of 5 by 2. Rated 5 out of 5 by Zastil from Saw this on PhotoInduction Youtube Superb output of light like having sun in your block of houses! See end of video as lights up his neighbourhood. Out of budget for most people and too bright for many uses but still great fun to be had with it. Rated 5 out of 5 by Anonymous from If you light it, they will come. If you can afford this bulb, you can afford the electric bill. As the other reviewer said, the video demonstration is impressive, just not sure why anyone would have use for it except when you are trying to light up the dark side of the moon.